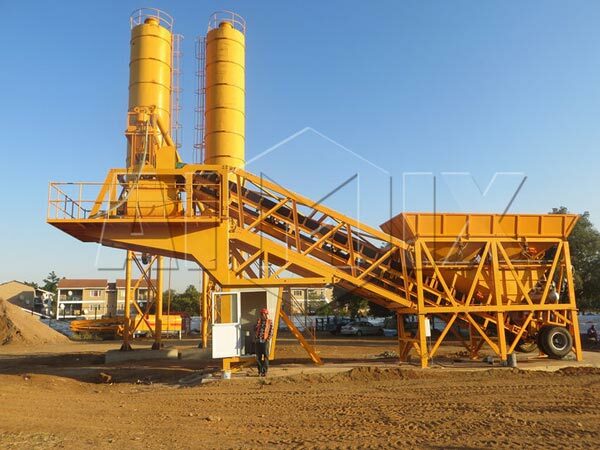 Mobile concrete batching plant is an indispensable equipment in modern production and construction, which provides the maximum convenience for the customers who need frequent site transition. What is the basic composition of mobile concrete plant? What are the characteristics? Aggregate measurement adopts cumulative measurement, which is totally accurate and reliable. Aggregate or concrete silos can be adapted to different grades of aggregate metering needs, which also has high-precision sensors and automatic compensation function, and it ensures the accuracy of aggregate measurement. The whole mixing plant adopts industrial computer control, which has data real-time processing function. The system has automatic or manual operation, which is simple and convenient. Interface simulation shows the entire dynamic process of the mixing plant, which is intuitive and clear. You can store a variety of mixing plant mixing and working data and print it according to the requirements of statements. The cement and powder is fed into the powder weighing bucket by the screw conveyor, and the weighing system is controlled by the weighing instrument. When the weight is reached, the control system sends an order to stop the screw conveyor. 4. Water and admixture weighing system. The water is measured by the high precision sensor, and it is then pumped into the metering bucket from the water tank through the filling pipeline. After finishing the weighing, the water is supplied to the mixing main pipeline through the two pipelines. Admixture weighing principle is basically similar to the water weighing.